Last week, we released HippoRemote LITE, a free (ad-supported) version of HippoRemote. 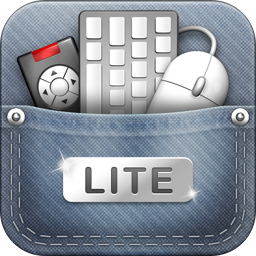 The story behind LITE is that it was totally unplanned. LITE was not on our “product roadmap”, so to speak. In fact, we didn’t think we would ever do free apps. Call us crazy, but we still believe in the concept of charging a (non-zero) price for our products. Ridiculous, right? As indie developers, we know how tough it is to create an app of any kind, especially with limited resources. We have great respect for the work of our fellow devs. But a global multi-billion dollar company should be held to a higher standard in terms of polish and attention to detail. And Touch Mouse, well, even for free it still left a bad taste. We thought we could do better and more importantly, we believe customers deserve better. And so LITE was born. It has the same ultra-smooth trackpad and smart keyboard as Basic and Pro, with two-finger scrolling, pinching and international language support, as well as Wake-on-LAN, Split-Screen Mode, and Shake-to-Toggle keyboard access. And it’s easy to add more functionality via the built-in Hippo Store. This is our first foray into free apps and we really don’t know anything about how this half of the App Store works. We might be doing everything wrong. If so, let us know! (Some of you already have. ☺) We want to hear your thoughts on the matter. What does this have to do with Basic? Basic originally was intended as a low-cost way for people to get to know us. The way App Store pricing has gone, $5 (for HippoRemote Pro) is considered expensive and people understandably don’t want to get taken by an unknown developer. So it was important to keep the price low. But we wanted to offer the new plugins we created. So we decided to make them available as in-app purchases. Now that we have LITE, the original pricing motivation for Basic is moot. In fact, Basic as a whole seems a bit redundant. So the question is: What should we do with it? Should we even keep it around? One possible option is to drop Basic entirely. But that would strand all our existing customers, which we won’t do. When do we get to the part about FREE PLUGINS? So this is what we’ve decided to do. With our next update to Basic, we will include all the plugins — Browser, Twitter, & Boxee — as standard components. No more in-app purchases. We will also raise the price of Basic from $1 to $3 — a 25% “bulk discount” over upgrading LITE piecemeal. In the meantime, we will continue to keep Basic at $1. This means you can buy Basic now for $1 and get the Boxee, Browser, and Twitter plugins for FREE when Basic is updated. You can still buy the plugins now if you really need them right away. But if you just sit tight and wait for us to finish coding and testing, and for Apple to approve the update, you’ll get all that functionality. For FREE. Hmm…maybe we’re starting to get this “free” thing after all. Hey Linux folks, thanks to Mark Crowther, we now have a MythTV profile. Grab it here. We don’t talk a lot about Hippo Basic, and I’m not really sure why. We’ve worked hard on it and I’m very happy with the end result. Lots of apps in the App Store have a base version and a pro version, where the pro version is the base version with more features. Hippo Basic and Hippo Pro certainly have many overlapping features, but we also put features into Basic that are not in Pro. Why? Because we don’t view Basic as a lesser Pro. We view the two to be complementary apps. Pro is obviously optimized for controlling media Macs and PCs. It’s designed for one-handed operation, like the traditional remote control that everyone is accustomed to. And though they are there, in the majority of my time using Pro, I never need to access the keyboard or trackpad. Basic, on the other hand, takes the opposite approach. With the full-screen arrow pad, it can work extremely well as a remote, but it’s first and foremost intent is to be a fantastic replacement for your keyboard and mouse. 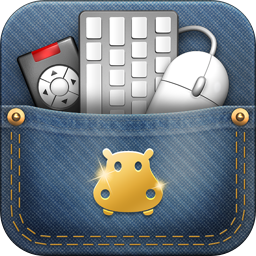 In other words, Pro is a remote with keyboard and mouse functions. And Basic is a keyboard and mouse with remote functions. The difference is subtle, but this is the perspective that informs our design choices. That said, what’s new in Basic v2.0? First, big enhancements to the trackpad. We’ve redone the gesture handling to be more responsive and more accurate. And we’ve added even more multi-touch gestures. For example, Mac users can now activate Expose, show the desktop, or switch between open programs with four-finger swipes, just like you can with the multi-touch trackpad on MacBooks. Windows users the the same functionality, and you don’t even need to buy a Mac! Second, you can now assign keyboard shortcuts and macros to gestures. This is a great productivity enhancer since you can execute frequently used commands without having to switch to the keyboard or hunt for buttons. And lastly, we’ve included the Hippo Store where you can purchase the Boxee, Browser and Twitter Plugins we introduced with Pro. You can pick a la carte the features you want. Want to use our fantastic Boxee gesture pad, but don’t need all the App Profiles in Pro? Now you can! Note that Plugin purchases apply to your iTunes account. This means if you run Basic on multiple devices, purchasing the plugin once will enable it for all of them. What’s New in HippoRemote 2.0? It was a rather long and winding development process, but HippoRemote Pro 2.0 is finally done and available in the App Store. So what’s new? What changes did we make that deserve the 2.0 label? For anyone tracking our blog, this one is pretty obvious. We’ve been beta testing user-created profiles since our last update. Beta users have created and shared profiles for EyeTV, SageTV, SlingPlayer, Spotify, TotalMedia Theatre, and more. And with 2.0, these profiles are now available to all. You can download them directly into HippoRemote from our web repository. Wait, did I say download from the web inside of HippoRemote? Yes I did. We’ve integrated a web browser into HippoRemote. This makes it super easy to access our profile repository. But it can do so much more. How many times when watching a show, do you see an actor and instantly wonder “where have I seen him before?” And you’d either have to pull out your laptop or exit HippoRemote and start up the iPhone browser to do your search. With our browser plugin, you can access IMDb and Google directly inside of HippoRemote. No laptops, no switching back and forth between apps. Furthermore, actor searches are just the tip of the iceberg. You can also read your email, update Facebook, check sports scores and even chat with friends via web-based instant messaging sites like Meebo. It’s total access to the web with total convenience. And what if you’re browsing and come across a video or photo you’d like to see on your TV? We’ve created a solution for that too! We call it Link Launching. It lets you send links from your iPhone to your media PC, so you can pick the screen that’s more appropriate and comfortable for the content at hand. Speaking of links, I get most of them through Twitter. And while Twitter’s mobile web site is quite nice, I’ve been spoiled by the performance and capabilities of the iPhone’s native Twitter clients. Scanning my timeline via the web interface feels slow in comparison. So to make this all just work, we’ve also added a native Twitter client to HippoRemote. It’s not meant to be a full-featured Twitter client, but we do support a number of convenience features that most dedicated apps lack. Auto-expanding shortened URLs so you can tell where a link is taking you BEFORE you click on it. Thumbnail previews of TwitPic and YFrog image links. And of course, Link Launching for letting you view the content you want on the screen that you want. You might be sensing an Internet theme to all our new features. There’s just so much cool stuff happening with the convergence of Movies, TV, and Music with the Internet. And Boxee is one company that’s really leading the way. We love the philosophy behind Boxee and we love their media center software (minus some of the bugs). And so we wanted to show our love with something special. If you run Boxee, you’ve probably tried their iPhone app for navigating the interface. It’s gesture based and quite slick. What we’ve done is tried to take it to the next level by adding multi-touch and a number of usability tweaks. Like momentum. So you can scroll long lists with a single flick. We also pull cover art from Boxee so you can tell at a glance what’s playing. We’ve added all this stuff, but how do you access it? The Browser and Twitter Plugins don’t really belong to any particular profile. They should really be available at any time. And so we created Quick Macros. These are five customizable macros that you can access from any profile with a quick shake of your iPhone. We’ve pre-programmed them with the Web and Twitter Plugins, as well as some other useful macros, but you can edit them to suit your own needs. New 3 & 4 finger multi-touch gestures. Scrolling momentum option, like the Apple Magic Mouse. Option for auto-pausing playback on an incoming phone call. Larger button targets for all existing profiles. I hope you’ll agree that Hippo Pro 2.0 is a massive update. Most other developers add one new thing and call it a major release. That’s just not our style. But more importantly, we want to let you take advantage of the iPhone’s capabilities and open up new ways of interacting with your computer. I hope you enjoy it! And as always, please send us feedback, both good and bad. We’d love to hear about what’s working for you and what isn’t. If you are using our HippoVNC server you MUST update to the newest version. See our previous post for notes on potential gotchas. HippoRemote Pro 2.0 has been approved and should be available shortly in the App Store, if not already. This was the fastest approval we’ve ever experienced! Needless to say, we were caught a bit by surprise. A post detailing all the new stuff in 2.0 will be coming shortly. In the meantime, Mac and Windows folks, if you’ve chosen to use HippoVNC, you MUST update to the latest version. Windows folks: Be sure to uninstall HippoVNC as a service and make sure that the server isn’t running (no icon in the task tray) before upgrading. Mac folks: Before replacing HippoVNC.app with the new version, make sure to shut down the system server if you are running HippoVNC in the background. From Zak Beck, a SlingPlayer profile for Sky+ and Sky HD receivers. This may not work “out-of-the-box” for other receivers, as we’re not sure if the shortcuts are the same. But since Zak’s done the heavy lifting, it should be much easier to tweak the profile for your specific setup. You can download the profile here. Profile creation is not quite out of beta yet (it will for our 2.0 update!) so you’ll need to send us an email to get it going. We put this notice into the What’s New section on HippoRemote’s iTunes page. But it’s buried at the bottom and so I think people might not see it. In HippoRemote 1.2.2, we added support for multiple monitors, but it also required us to update HippoVNC. If you’re getting a Connection Lost error right when HippoRemote goes to the trackpad, you need to update to the latest version (0.2.1). You can download it here. If you’re using OS X’s built-in Screen Sharing, then please ignore everything I just said. Thanks to JodyOne for a Spotify for Mac profile. I love the subtle glow highlights when a button is pressed. A beautiful touch. You can download it here. As before, you’ll need to join our profile creation beta to be able to use this profile. Simply send us an email to join. We get asked this question a lot. And until recently, we didn’t have a good answer. But thanks to Chris Hulett, HippoRemote now has EyeTV support! Chris has already churned out a few revisions, each better than the last. To be able to install Chris’ latest EyeTV profile, you have to be part of our profile creation beta. If you aren’t, don’t worry. It’s open to all HippoRemote users. Just send us an email and you’re in! Ever since it crossed my radar a couple weeks ago, I have been addicted to Canabalt. Love the visuals, love the music, love the simplicity, love the gameplay. Love it all. So as a thank you to all of you partaking in our profile creation beta, here’s a Canabalt profile! Now you can Canabalt away from the comfort of your couch. And though we generally recommend one-thumb HippoRemote operation, for this game, the boost in reflexes from using your index finger is pretty essential. And be sure to support the Canabalt developers and buy the iPhone version (App Store Link). Just $3 for endless hours of fun. P.S. If you’d like to join in on the profile creation beta, just send us an email. So Apple caught us a little by surprise. Not only did 1.2 get approved weeks faster than any previous release, but it also was approved on a Sunday! Looks like some people over at Apple are working overtime. New Profiles. By popular demand, we’ve added profiles for VLC, PowerPoint, Keynote, and Gmail. Auto-Connect. This saves a lot of time if you only connect to one machine. And if you’ve entered the MAC address, HippoRemote will also try to wake up the machine using the built-in Wake-on-LAN functionality. Macros. It’s not really feasible for us to track every available shortcut in every supported app. With Macros, you can now add any we’ve missed. Furthermore, Macros let’s you create sequences of shortcuts so you can automate any repetitive tasks. Landscape Keyboard. For those of us who need the extra space. Unicode Support. We now support all the languages available on the iPhone. Note that you’ll need to use HippoVNC (our customized VNC server) to enable this feature. See the setup page for more info. Proximity Sensor Support. To save battery, enable the Proximity Sensor setting. When you’re not using HippoRemote, simply flip your iPhone on its face to disable the screen. Automatic App Launching & Switching. Another feature that requires HippoVNC. Now changing a profile automatically launches the app or switches to it if it’s already open. One more thing…A lot of you have asked for the ability to create your own profiles. We’ve added it, but we’d like to gather some more feedback before making it broadly available. If you’d like to try out profile creation, please send us an email at our support address. Note that to get the most out of profiles, you’ll need an image editor as well as a text editor.